Kitao Shigemasa is mainly known for his Prints of Beautiful Woman and famous Courtesans of his day. 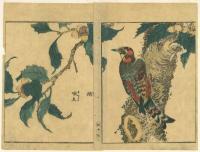 He did, however, produce in 1795, this marvelous and rare series of Birds and Flowers. Size: 8 1/2 x 11 5/8"
Size: 12" X 8 1/2"
Size: 11 1/2" X 8 1/2"
Size: 7 x 11 1/4"